La Sala - New look, Same Style! If, as the old saying goes, “a week is a long time in politics”, then six years in the restaurant business is an eternity, especially in Marbella. 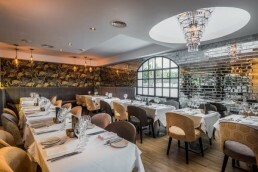 La Sala opened in 2010, and since then it has become a “must do destination” for any visiting celebrity, Premiership footballer and Reality TV star with a list that includes Prince Albert of Monaco, Sir Alan Sugar, Eva Longoria, Tulisa, Ronan Keating and Jamie Oliver. The makeover was designed to make La Sala feel more contemporary and it’s certainly striking. One wall has mirrored tiles, another features a Flamingo wall covering, and the main restaurant now has a more urban feel to it, especially on the night that I visited, bathed in soft lighting. The busy kitchen is still glass fronted that allows you to see the chefs working away, and the new Live Lounge has also had a makeover and looks stunning. It’s not only the interiors that have had a makeover. Part of La Sala’s front terrace has also been glassed over, allowing you to enjoy al fresco dining, no matter what the weather! As well as the food – of which more in a moment – La Sala has always been about music and having agood time. The new refit has seen the introduction of a DJ booth, and live music every night is a standard at La Sala. There was a lively La Sala crowd when I arrived, enjoying a great vibe. Smart casual and upwards seems to be the unwritten dress code, although you won’t feel out of place in jeans and jacket. On this occasion I was dining on my own. My dining companion called from Gibraltar just before we were due to meet, apologising that she wasn’t going to be able to make dinner. I’ve had women blow me out on dinner dates before, but never from a different country! Table for one it was then, and I took a look at the starters. These included a traditional and classic prawn cocktail, capaccio of beef, a selection of Nigiri and Maki Sushi, traditional Iberian Ham and Manchego Cheese and Baked Camembert. I plumped for an old La Sala favourite – Classic calamari with ali oli – one of Sala’s most popular dishes. I’m more than happy to report that they haven’t messed with a winning formula! For a main course I chose Shepherds Pie that can’t be beaten as great comfort food, especially on a Marbella winter night. It arrived with lots of peas and carrots and gravy. I make a mean Shepherd’s Pie myself, and this one was good too. So much so that I had to fight the urge to mop up the gravy with the rest of the bread, as I would do at home! Other main courses include Yakitori noodles, a great range of fish including merluza, lubina and swordfish cajun style,Green Thai Curry, BBQ ribs, entrecote and solomillo from the grill as well as Spaghetti Vongole La Sala Style and Chateaubriand for two. As I finished I reflected that it was hard to believe that the building stood practically empty and overlooked until Sala Group took it over over six years ago. La Sala’s new look and feel is very much a reboot of a successful restaurant rather than total makeover that could have ruined much of what made it great in the first place. Lots of restaurants – such as Don Leone and Da Paolo – have undergone “modernisation” and have been completely ruined in the process.